A few times in my life I've worked on things which were a bit futuristic. In the 1980s I'd tell people about how useful email was and they'd mostly look at me a bit odd. The world's first smartphone. EO440. 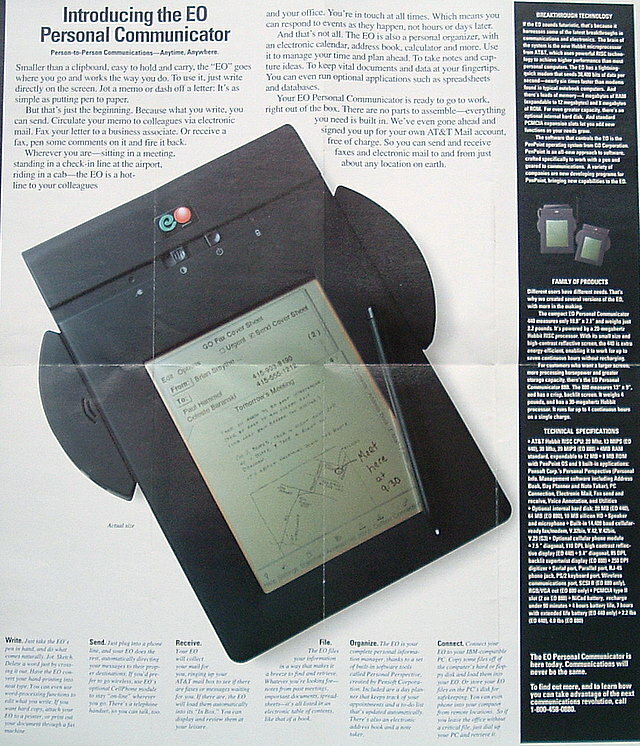 In 1993 I worked on a device which really wasn't so different to the iPad you can buy today: A flat portable computer which communicated using (analogue) cell phone technology, could send emails and faxes, and was operated with a stylus on the screen. Rather more recently, I've worked for 18 months on the Sinner Mango velomobile. Truly a vehicle from the future. I'm very proud to have been associated with both of these products. I started at Sinner in order to help with increasing production in order to reduce the long waiting list for a Mango. My colleagues and I have worked hard over the last year to make Mangos better than ever before. A few larger changes, but many small details which are not necessarily visible to the customer, result in the current production being better finished both inside and out, lighter and faster. I suggested the Mango Sport and the Red Edition as products, and these successfully increased demand for Mangos. However... not quite enough to support or warrant an extra employee. Yesterday was the last day of my contract with Sinner at the Ligfietsgarage in Groningen. Mango production is continuing, of course, and I'll probably still be involved from time to time, but not as a regular employee. So to summarise: I have no complaints. I had wonderful colleagues for 18 months, building Mangos for customers, and Sinner is a very good company run by hard working, honest people. Never before have I so much enjoyed working for minimum wage. The Mango is a wonderful velomobile. As a product, it's better now than ever, and as the waiting list will probably now start to slowly get longer again this is perhaps the best time ever to order one - and I'm not paid a cent to say that. For me it's now time for a slight change of direction. I'll be able to put a bit more time into making baskets, the production of which slowed dramatically over the last 18 months, and we'll plan a wider range of cycling holiday destinations for next year's customers. For instance, you won't find us offering to sell you the Mighty Amsterdam Lock in our web shop, but you will find the excellent AXA Defender Lock. This coming Sunday I'll be racing my Mango in Groningen again. I'm very much looking forward to it. Great idea, that web shop. But what are your shipping costs, especially to other European countries? Could not find it on the site or do I have to login for that? Christoph, thanks for your feedback. I suspect there will be a few glitches to begin with. Please bear with us. I very much appreciate any feedback about problems. The shipping costs should appear when you click on "checkout", though you do also need to enter your details at that point so that it knows where the goods are to be sent and then can calculate the correct price for you. We won't spam you. Shipping costs at the moment are set to what we expect the post office to charge us, with no allowance for the cost of packaging, so they are quite competitive. I should add that you haven't committed to buy until well after you've seen the shipping cost. If you are looking for recommendations, the Nokian W240 winter tires are pretty good. Higher rolling resistance than the Marathon Winters, but not a lot higher, and a good deal better traction. (I've tried two kinds of Nokian studded tires, and two kinds of Schwalbe studded tires, and on actual ice, the W240s provide a lot more confident feel of the road). Please please add some skirtguards to the store. They are essentially impossible to find in North America. I wish you success David. I found that you've been a very patient and intelligent man, good at dealing with (extremely?) difficult and impatient customers (like me). I also think you have some good entrepreneur skills which come to use for inventing stuff. I doubt you can just sit still and let time pass without at least trying to improve something. I am very happy that I got my Mango+ before the waiting list grows even longer. I think the time I had to wait, 2 months? was far too long already, I can not imagine how long time future customers will have to wait now. I would not call the Mango a product of the future, because it is available today. I love mine, and I regret that I offered a friend he could borrow it for a whole day so he can try commuting in it before he might order his own. My precious is a Mango+, but my friend fancies the Red Sport edition. I rode my Mango+ home from Groningen to Copenhagen. 600 km in 5 days. I planned to leave at 12, but due to bad circumstances I was not able to leave before 18 :-( And I had to cover 130km the very first day before I reached my prepaid hotel. My primary GPS did not work once I set off. During the ride my spare GPS said low battery, with still 2-3 hours to go before I reached the hotel. I feared getting lost or stranded somewhere in Germany. But the stability and support I got from my Mango+ made me confident enough to continue, even when the GPS told me to go off road through a forest, and the light ran out during that forest ride. And somehow I reached my hotel at 02 am. I would have given up hours before if I was riding anything else, but with my Mango+ I was kept warm, dry and comfortable enough to bike 130km the very first day, even if I am horribly out of shape (BMI=34). David, I hope you keep doing your interesting blog posts besides your bicycle shop, though I fear that with all the good products then you wont have as much time as before. I've seen a few I like. Firstly, I was a bit saddened & shocked to hear that you'll be leaving the Ligfietsgarage! It is clear (to me, anyway) that you are passionate about the Mango - a shame they couldn't keep you on full time. I would have never have heard of it if not for you and your wonderful blog. On the other hand, change is what makes life interesting and I look forward to your web shop! I too am undergoing some big (risky) changes in my life work-wise, to the disappointment of my colleagues. We've decided some time ago that we're hopping off the treadmill of more, more, more. In the coming years I would like to start a bike shop here which sells practical upright bikes - something lacking here. In the end you have to do what makes you and your family happy so congratulations, and I look forward to reading more about your future - please don't stop this very special blog! I hope you may still introduce me to the Mango next year - I was looking forward to that personal touch. I will look into the Nokian winter tyres as I've heard before that they're good. Skirtguards are also a very good idea. I'll add some tomorrow. They're not just for skirts, btw. The Dutch call them "jasbeschermers" - or jacket protectors because they keep coats out of the rear wheel. They're fitted on men's bicycles as well as women's (including my town bike). Jon: Thanks for your kind email. I've been a bit busy for the last few days, but I will respond to your email tomorrow. I think you did very well on your ride back home. From what I can tell you did several days in a row riding the longest distances you've ever ridden in a day, and you had a lot of luggage with you. I always thought you would get home, but I had a bit of concern when you set off so late from Groningen on the first day. If you get just half the pleasure from your Mango that I've had from mine then I don't think you'll ever regret buying it. It is quite amazing how warm you stay inside it even in horrible conditions. Paul, thanks for your message. If at all possible I hope to see you next year when you come to get your Mango. I know what you mean about stepping off the treadmill. We did much the same, with my pulling out of writing software for a living back in 2004 and slowly moving over here. I agree that it's best to do what makes you happy, not necessarily what makes the most money. BTW, I do intend to keep updating the blog. My favourite Dutch product is the 70L Basil panniers that I've got on my Pashley Sovereign Roadster. Thanks to them, I can put an entire trolley of groceries on my bike. When I wheel the trolley up to my bike, people don't believe that everything will fit. But it does. It was the longest, but I have done 2 at 111 (with cargo) and 100 (race). I had no choice but to set off, and when I set off I still expected I could do it in 4-5 hours at 30 km/t average. Jon: You'll get faster as you get more used to it. Also, it'll help a great deal if you carry less luggage. You had an awful lot of weighty stuff with you. David, how exciting!! I love those permanent 'bungies' - don't really see them here in Australia but I got a 'take off & on' one with my 'Amsterdam Electra' when I purchased it - brillient and envied far & wide. Good luck with your new venture - sounds fun! Hello David, you'll certainly be missed at the shop. Such good colleagues are rare. Fortunately there will be the sunday rides and of course the races every now and then. Looking forward to keep on meeting you. @Jon: I'm impressed by the way you did your first long trip untrained, especially the very first day must have been very hard. I had far too much stuff with me. I did not even use half. But I did not know what I needed as I packed my bags. I even carried clothes for sightseeing in the towns I visited. But I was far too tired to do any of that. It was very hard. And the 2. day I did not get going before 12, which meant arriving at about 21:30 after another 130 km. The 3. day I left at 10, and only did 100 km. 4. day was 60km in Holsteins hills, and then +50 km on flat Lolland. 5. day was 60 km in hills, and then another 60 with almost no hills. I was close to give up once the backup GPS said low battery, and then when I got lost in the next town. I reckon that in making available the practical products us mere mortals don't have 'marketed' to us otherwise, your change in direction will be doing us all a big favour. We'd love to see some decent-quality parking prop-stands. The one I have on my Batavus is excellent (it even folds up out of the way if you wheel the bike backwards) but the one on my wife's Gazelle isn't sturdy enough with a trailer bike and/or heavy loads. Can you get hold of the Batavus stand? I am sorry to hear you leave the Mangos and at the same time wish you success with Bike Bits! I do have an AXA Defender but might need another one for my another bike so I'll check it out. My urge was to say 'I'm sorry to hear you're leaving Mango' - as Mango was evidently a passion. But I'm sure pastures new will reap different rewards. Your blog is an inspiration to 'the few' dedicated UK cyclists not wedded to Vehicular Cycling. Long may your blog continue. Good luck David with your new endeavour(s). PS After last winter (UK) I would like to buy some studded tyres. What's the width of the SCHWALBE MARATHON WINTER STUDDED TYRE, 1.9? My current stead is a Thorn Raven, with road tyres at 26x1.5 (with mudguards), what would you recommend? Now that was fun... again.